The final paragraph of the first letter of Peter is one of salutation, but in the midst of it occurs this statement: “I have written unto you, briefly, exhorting, and testifying, that this is the true grace of God; stand ye fast therein." This closing affirmation of the writer, inserted parenthetically, startles, demands attention, and compels a consideration of .the message in the light of what it says. In these words the apostle first described his method: “I have written unto you, briefly, exhorting and testifying." The word translated “exhorting" suggests all the qualities of the ministry of the Holy Spirit, coming from the same root and having the same values as the word Para­clete. In the word translated “testifying," we find the same values as in the word of Jesus describing the work of His dis­ciples, witnessing; and the root from which the word comes is the same as that from which our word martyr is derived. The methods of the apostle then, were those of exhortation, that is such teaching as was for instruction and encouragement; and testimony, that is, witness out of personal experience. Then he declared his theme, “That this is the true grace of God." That is to say, the real subject of all his exhortation and testimony was the grace of God. Finally, he made his last appeal in the words “Stand ye fast therein"; that is in the grace of God, which had been the theme of his exhortation and testimony. The central teaching of the letter then is that of the sufficiency of grace; while its abiding appeal is that we stand fast therein. Now it must be admitted that this is a startling statement, for at first it does not seem that the grace of God has been the definite, specific theme of the letter. “According to the foreknowledge of God the Father, in sanctification of the Spirit, unto obedience and sprinkling of the blood of Jesus Christ; Grace to you and peace be multiplied" (1:2). "Concerning which salvation the pro­phets sought and searched diligently, who prophesied of the grace that should come unto you" (1:10). "Wherefore girding up the loins of your mind, be sober and set your hope perfectly on the grace that is to be brought unto you at the revelation of Jesus Christ" (1:13). Thus in the first chapter this great word grace occurs three times. wrongfully. For what glory is it, if, when ye sin, and are buffeted for it, ye shall take it patiently? but if, when ye do well, and suffer for it, ye shall take it patiently, this is acceptable with God" (2:19, 20). "Ye husbands, in like manner, dwell with your wives according to knowledge, giving honor unto the woman, as unto the weaker vessel, as being also joint-heirs of the grace of life" (3:7). "According as each hath received a gift, ministering it among yourselves, as good stewards of the manifold grace of God" (4:10). Thus we find the word once both in chapter three and chapter four. "Likewise, ye younger, be subject unto the elder. Yea, all of you gird yourselves with humility, to serve one another: for God resisteth the proud, but giveth grace to the humble" (5:5). "And the God of all grace, Who called you unto His eternal glory in Christ, after that ye have suffered a little while, shall Himself perfect, establish, strengthen you" (5:10). “This is the true grace of God: stand ye fast therein" (5:12). Thus we find it three times in chapter five. That very simple exercise at least reveals the fact that the word is found in every chapter of the letter. In considering the content of this letter, we found that the thought is ever that of the establishment of Christian people, and the word grace is in every division. The first great statement of the letter is the expression of desire, "Grace to you and peace be multiplied"; the final declaration of the apostle is, "I have written unto you briefly, exhorting, and testifying that this is the true grace of God: stand ye fast therein"; and in every division the word appears not by some studied arrange­ment, but incidentally, naturally; it is the central word of the argument, and the appeal finds in it its value and force. It is also remarkable that in every case the word grace occurs, not in the earlier part of the division dealing with doctrine, but in the application. There is first the introduction, in which the writer introduced himself as the apostle, and described his readers as elect; but it was when he came to the explanation of the word elect, and breathed the desire of his heart that these people might come to practical experience of what it is to be elect, that he said "Grace to you and peace be multiplied." The second occurrence is in the latter part of the first division; not in that section describing the life of faith, the statement of doctrine; but in that section in which doctrine is related to duty. So also in the second division, the word is found; not in the first part dealing with the doctrine of holiness, but in the section dealing with the practice of holiness. In the third division, the word occurs, not in the part dealing with the theory of victory, but in that showing the process of victory. So also in the last case; not when the apostle was describing the life of conflict or the fellowship of conflict, but when he wanted men to understand the secret of strength for that conflict did he use the word. All that may seem technical. It does, however, help us to realize that throughout the letter the fact of the grace of God was present to the mind of the writer; and it serves to explain his concluding word, "This is the true grace of God." As we saw in studying the content, the Main purpose of the letter is that of the establishment of such as were passing through suffering and difficulty and testing. The writer established his brethren by showing that all that was needed for strength was provided in the grace of God. Indeed, I should be inclined to say, that if we want a perfectly accurate sub-title for the mes­sage of this letter, we may quote from Paul, "My grace is sufficient for thee." That, as I understand it, is the living mes­sage of this letter. In the essential message then the central teaching is that of the sufficiency of grace. This we may divide into six parts suggested by the passages to which we have referred. First, The Fountain and the River. 1:2. Secondly, The Secret of Confidence. 1:10, 13. Thirdly, The Secret of Conduct. 2:19, 20; 3:7. Fourthly, The Secret of Character, 4:10; 5:5. Fifthly, The Secret of Courage, 5:10. The waters of the river, to quote the figurative language of Ezekiel, come by the way of the altar; that is the river of the living grace, the river of which Ezekiel declared, everything lives whithersoever it comes. From the Saviour's wounded side." Go farther back than that, and we find that the river proceeds from the very heart of God. "Grace unto you and peace be multiplied." "This is the true grace of God." The central teaching of this letter is that of the sufficiency of grace. It opens not by a doctrinal statement or by argument; but with a great expression of the apostolic desire for those to whom he wrote, "Grace unto you and peace be multiplied." For all my night has passed away." Only the man who lives in the land fertilized by the rivers of grace can sing that hymn, and understand its meaning. In the opening passage the word "grace" must be interpreted by that which imme­diately precedes it. "To the elect . . . according to the foreknowledge of God the Father, in sanctification of the Spirit, unto obedience and sprinkling of the blood of Jesus Christ." In those words we see the great fundamental verities of our faith homed in the being of that one triune God Who is Himself Father, Son, and Spirit. We must interpret "grace" by these phrases, and by these doctrines of the faith. "Grace unto you and peace be multiplied." Recognizing the source whence this river springs, we see how it is the secret of confidence. Take the whole passage in the first chapter and let me summarize it thus. There are two things to notice in the operation of grace. First; it was foretold by the prophets, "Concerning which salvation the prophets sought and searched diligently." Second; it is supplied through the Advents of Jesus, "Set your hope per­fectly on the grace that is to be brought unto you at the revelation of Jesus Christ." What were the prophets looking for? They were searching what time or what manner of time the Spirit testified when it testified the suffering of Christ and the glory which should follow; these are matters into which the very angels desire to look. The pro­phets foretold that grace. For the inter­pretation of that fact we need the four, and the twelve. Their theme was ever that of grace which was to come. It came by the suffering of Jesus, and assures the glories that follow His suffering, those glories which will have their full outshining at His revelation. The two Advents are in view. Thus Peter shows that our secret of confidence is the certainty of that grace to which all the prophets bore testimony, and which became operative in human his­tory and life through the work of Christ. It is also the secret of conduct. This is illustrated in the simplest relation. In all the apostolic writings, the most radiant, beautiful things of the Christian life are spoken of as being exhibited where the world would be least likely to look for them, The grace, that is the glories and beauties flowing out as the result of this life communicated by Christ, is most radiantly revealed in the most trying and difficult circumstances. Servants, if you endure wrong patiently, this is grace. Conduct can have its most beautiful manifestation of the power of this grace in circumstances the most trying and most difficult. Conduct can be manifested most perfectly and beautifully, as Paul suggests, by that most sacred union between husband and wife, the most perfect revelation of the union between Jehovah and all trusting souls; for we are "joint-heirs of the grace of life"; and in the power of that grace we are to meet all the difficulties of every­day life, that our prayers be not cut off, or hindered. Servants whose masters are ungodly and unjust have a great oppor­tunity to reveal the grace of God. That is the point you miss if we read "accept­able with God," when the word is the same, and we should read "This is grace with God." If today in some house of business, for Christ's sake men and women have suffered wrongfully, and patiently God has there plucked the fairest flowers that have blossomed in this land. This is grace with God. The commonplaces of home-life may be sanctified, glorified, and made to flame with the beauties of the grace of God. This is the true grace of God. Yet again, grace is the secret of character. Peter urged those to whom he wrote to use "hospitality one to another without murmuring, according as each hath re­ceived a gift ministering it among your­selves, as good stewards of the manifold grace of God." What a strange and wonderful merging of the commonplace and the sublime according to the measure­ments of men. Hospitality and the ministry of the Word in the assembly of the saints! The grace of God is the secret of such character. Or again, "All of you gird yourselves with humility, to serve one another: for God resisteth the proud, but giveth grace to the humble." Grace is not only the source of hospi­tality and communion, it is the ground of humility. These are the things of high character. The Christian character is revealed in beauty in these commonplaces of life. What is, at once the inspiration of character that is filled with hospitality and with love; and the ultimate crown of beauty upon that character? The humility that girds itself for service. The Greek word there will bear translation by a phrase; Gird yourself as with a slave's apron of humility. Peter was surely thinking of the day when Jesus took a towel and girded Himself and washed the disciples' feet. He was re­membering that the towel, the sign and badge of slavery, was made by Jesus the insignia of nobility in His Kingdom. The secret of such character is the grace of God. Then we come to the question of con­flict. "Your adversary the devil, as a roaring lion, walketh about, seeking whom he may devour. . . . The God of all grace, Who called you unto His eternal glory in Christ, after that ye have suffered a little while, shall Himself perfect, establish, strengthen you." Grace in the conflict is the guarantee of the glory which will be perfect, and of final victory over the forces of evil that are against us. The inclusive thought of the abiding appeal is that we are to live in the country watered by the river of grace, and that the apostle expressed in the charge "Stand ye fast therein." Go over the four thoughts again. When faith is tried, remember that in grace there is perfect resource which being appro­priated will make us strong in the Lord, and in the power of His might. When faith is trembling, let us come into new understanding of the sufficiency of this grace of God, and faith will triumph. When circumstances are difficult—and do not let us be afraid of the simplest illustrations—in the place of service which is not appreciated when it ought to be, in all the constant difficulties of the home, if we would manifest that conduct which is in harmony with the will of God, the resources are in grace. When we fail, it is because we neglect the grace of God. When suffering for conscience' sake, being persecuted because we bear the Christian name, how shall we bear it, how shall we still manifest the Christian character? Only in the power of this grace. When assaulted by the adversary who goes about like a roaring lion seeking; how are we to overcome? Only by re­membering that our God is the God of all grace; and that through suffering and the assault of the adversary, He will perfect that which concerneth us. The abiding appeal I can venture to make in no other way than by using the great words, "For you therefore which believe is the preciousness." Link that very carefully with the teaching which goes before it; living stones coming to the living Stone, and the living Stone, elect, precious." Then follows the de­claration, "For you therefore which believe is the preciousness." When we come to Him He communicates to us those virtues which constitute His preciousness, and we become precious also. Preciousness is the result of having the elemental forces com­pacted together into consistent strength. Peter was an elemental man, lacking precious­ness until Christ gave him His own nature, His own life; and then he became precious. What is a precious stone? It is the em­bodiment of passion mastered by principle. That is the thought in the figurative language of one of the old prophets, "the stones of fire"; the diamond is a stone of fire; it is precious, solidified, mastered by principle. This is the great truth about grace. Grace communicates to us the preciousness of Christ; all that which in Him was precious to the heart of God, that which made Him the one ultimate and lonely glory in the diadem of Deity, is made over to us. If we take the individual stones that thus receive His preciousness, and build them into the whole assembly, what then? Then the description follows, "Ye are an elect race, a royal priesthood, a holy nation, a people for God's own possession, that ye may show forth the excellencies of Him Who called you out of darkness into His marvelous light." The preciousness of Christ being communicated to individuals, the whole company of such individuals, will reveal the Excellencies of God. Grace is the secret of all establishment in the Christian life. It is the river that flowing through the desert makes it blossom as the rose until it becomes Em­manuel's land. "All the rivers of Thy grace I claim. Over every promise write my name. Grace there is my every debt to pay, Blood to wash my every sin away, Power to keep me spotless day by day." "This is the true grace of God: stand ye fast therein." In dealing with the content of this letter we indicated its theme by suggesting as a sub-title, Christ and His Ethic. Its burden is ethical, not doctrinal. Some of the funda­mental truths of our most holy religion are hardly referred to from beginning to end. The writer was pre-eminently occu­pied with the practice of Christianity. "I say unto you, that except your right­eousness shall exceed the righteousness of the scribes and Pharisees, ye shall in no wise enter into the Kingdom of heaven." "Ye therefore shall be perfect, as your heavenly Father is perfect." "Take heed that ye do not your righteousness before men, to be seen of them else ye have no reward with your Father which is in heaven." I have taken these three because in some senses they are inclusive. In the first one, by way of introduction our Lord uttered the fundamental demand of His ethic; "Except your righteousness shall exceed the righteousness of the scribes and Phari­sees, ye shall in no wise enter into the Kingdom of heaven." These words were spoken immediately before the actual enun­ciation of His laws. In the second the King revealed the ultimate aim of His ethic; "Ye therefore shall be perfect, as your heavenly Father is perfect." Immediately following we have the King's revelation of the abiding principle of His ethic; "Take heed that ye do not your righteousness before men, to be seen of them." The fundamental demand was for right­eousness exceeding the righteousness of the scribes and Pharisees, which was intellec­tually orthodox, but lacked the harmony of the corresponding life. The ultimate aim was that of the per­fecting of humanity in harmony with the character of. God. The abiding principle was that of doing everything as in the sight of God, and to be pleasing to Him, rather than in the sight of men, to be pleasing to them. In these three words then we have the master principle of the ethic of Jesus. For the purpose of the present article and by way of introduction let us give a little closer attention to the word revealing the ultimate aim; "Ye therefore shall be perfect, as your heavenly Father is perfect." With that in mind we turn at once to the letter of James, and within the first few sentences we find these words, "Let patience have its perfect work, that ye may be perfect and entire, lacking in nothing." The interpreta­tion of the perfection which James instructed must be discovered by an understanding of the perfection which Jesus demanded. Before uttering His laws, Jesus had said that righteousness must exceed the right­eousness of the scribes and Pharisees. Righteousness is not to be a thing of words, but of works; not of creed, but of conduct; not orthodoxy of doctrine, but fulfillment of duty. Perfection is righteousness accord­ing to the will of God, rather than according to the opinion of men. That perfection, the perfection of right­eousness which seeks to be pleasing to God, and makes that the one unending, unceas­ing, unbending aim of the life, can only result from faith in God. So that the root of righteousness is faith, and the fruit of faith is righteousness. That takes us back to that central enunciation of the master principle of life in the prophecy of Habak­kuk, "The just shall live by his faith." That word of Habakkuk reappears constantly in the teaching of Jesus. He consistently linked life to belief. One absolute illustra­tion is found in a word recorded in the third chapter of John, "He that believeth on the Son hath eternal life." We must not be narrow in our interpretation of that great word. It has to do most certainly with the initial fact that a man believing on Jesus receives the gift of life; but it has a much wider application. Life is the outcome of faith. "The just shall live by his faith," both as to the beginning, and as to the continued victories and manifestations. The proof of a man's belief in Christ is the manifestation of the Christ-life in that man's life. Paul argued for the same principle and always in relation to Christ Himself. In Galatians he declared that there is no righteousness by law, and quoted the word of Habakkuk. In Romans he put the declaration into close connection with faith in the gospel of the Son of God. In Hebrews, he—or someone else—put the same quotation in relation to the Second Advent of our Lord. That principle is recognized by James. It was stated to the prophet; the fulfillment of it was claimed by Christ in. His own Person; it was argued by the great apologist of the gospel, Paul; it was illustrated by James. The theme of James was pre-eminently that of faith producing works. James did not argue against faith; he argued for faith. Recognizing this fact we turn to con­sider the essential message of the letter, and find that its central teaching has a posi­tive and a negative emphasis. The positive teaching may be summarized thus; Faith in God produces life according to the will of God; while the negative teaching is that life contrary to the will of God denies faith in God. It may appear at first sight that the teaching of this letter is entirely negative, but the negative is only of value as we discover the positive behind it. It may be said that the negative is really the central teaching; if a man say he has faith, let him show it by his works; life contrary to the will of God denies faith in God; if a man shall say he has faith, and his life is not life that springs out of faith, then his affirmation of faith is false. But it is at once evident that such a negative statement implies a positive truth. Consequently we have in this letter quite as surely the positive teaching, that faith in God produces life according to the will of God. The abiding appeal of the letter is two­fold; first, prove your faith; second, perfect your patience. The two injunctions are intimately associated. There is an application of the letter; first to the individual, and second to the Church. Familiarity with the movement of the letter, with its content and line of argu­ment, will show how James first of all declared that faith in God produces life according to the will of God; and that in two respects. He gave those to whom he wrote two pictures, one of personal life, and one of relative life; and in each case he illustrated the fact that where there is faith in God, the life harmonizes with the will of God, insisting that it must do so, that there can be no escape. His first picture is one of individual life in circumstances of trial. He shows that where a man lives by faith in such circumstances his attitude is that of patience. Faith produces patience in trial. His next picture is one of individual life in the midst of enticement to evil. In such circum­stances the man living by faith remains steadfast, and is victorious over every temp­tation. His final picture is one of individual life in the matter of religion. When there is faith in God, "Pure religion and unde­filed before our God and Father is this, to visit the fatherless and widows 'in their affliction, and to keep himself unspotted from the world"; that is to say, religion is love. The one and only principle which enables a man to live this life harmonizing with the will of God, is faith in God. When a man of faith is in the midst of circumstances of trial and difficulty, his attitude is that of calm patience. We know how true this is when we test the matter by personal experience. When the child of God in circumstances of trial is impatient, it is always because confidence in God wavers. Faith failing, patience passes away. Christian souls living by faith in God in the midst of circumstances of trial are not callous; not hardened. They are conscious of the sweeping of the storm; but they are filled with quietness and patience. Faith in God is the only prin­ciple which can produce that patience in the soul of any man or woman in circum­stances of trial. In dealing with the subject of entice­ment to evil, James gives us a wonderful definition of the genesis of sin. No man is lured toward evil by God. A man is drawn away, enticed, of his own lust. By faith in ­God there is steadfastness, and refusal to answer the enticement. There is no other secret of victory over temptation to sin than that of faith in God. No man is safe to­day by reason of the fact that for ten, twenty, thirty, forty years he has been a Christian. Men are not safe one moment longer than they live by simple faith in God. It is perfect faith in God which gives perfect victory over enticement to­ward sin. So also in the matter of the life of religion in the truest, deepest sense of the word. There is no more wonderful definition of religion in the New Testament than this; and it is only faith in God which inspires a man to give expression to his religion in acts of love and sympathy. Destroy faith in God, and by that act you destroy love toward man. With regard to relative life, James shows what faith does for a man in these respects; in thought, in speech, in action. In thought, by faith in God a man ceases to be a respecter of persons. As he looks upon his fellow-men, if he has faith in God, he sees these men as they are related to God, and thus loses sight of the things that the man who lacks faith in God sees. If a man has no faith in God he is material in his outlook upon his fellow-men, and expresses it by differentiating between rich and poor. The man who lives by faith in God sees every man as related to God. I have sometimes said in speaking of our Lord that which is not literally true, but which is true in spirit; that Jesus looked upon Scribes and Pharisees and never saw their phylacteries; and looked at poor men and never saw their rags. That is not literally true, for He saw everything; but it is spiritually true that His mind was not affected by the incidentals, but by the essentials. We divide as between men, and hold them in differing approbation on the basis of the incidentals. By faith in God every man is seen to be a man. The thought of every man as to his fellow-man is determined by his faith in God, or his lack of such faith. Faith in God creates that attitude of mind toward our fellow­men which may be described as having no respect of persons. "There is no respect of persons with God." The man who is living by faith shares the Divine attitude of mind toward men; he is without respect of persons. As to speech, we must look for the positive carefully. James is emphatic about the negative, the evil of the tongue. The paragraph which immediately follows is one that speaks of the heavenly wisdom that will not lie. The speech of the man who lives by faith in God is characterized by the silence of heavenly wisdom. Faith in God makes more for silence than for speech about our fellowmen. As to action; faith in God brings peace as between man and man. Wars, strife, enmities, these are never the outcome of faith in God. War in any kind never results from faith in God. When we come to the individual aspect, it is certain that strife as between man and man cannot be the outcome of faith in God. The life of faith in God is a life that has no respect for persons; and is characterized by that carefulness in \speech which is most often manifested in the silence of heavenly wisdom, and by those activities which produce peace between man and man. That constitutes the positive teach­ing of this letter. We turn now to the negative. Life contrary to the will of God denies faith in God. Personal life in trial is storm-tossed, like the waves of the sea; and such experience is proof of lack of faith in God. I say it very carefully because I know how it searches the heart, and yet I know it is true. When in hours of trial and suffering we murmur and complain, it is because we are failing in faith. In the matter of enticement toward evil, a man is drawn away of his own lust, and enticed. If he yields, it is because he fails in faith toward God. It is a searching, practical word. We cannot attend to the message of this letter without feeling how very practical it is. Whenever we sin it is because our faith fails. Discussions as to whether it is necessary for the believer to sin or not is surely unnecessary. Whenever we listen to the clamant cry of lust, and answer it independently of the Divine will, it is because we fight in our own strength; but it is finally because we fail to trust in God. No man need be overcome by enticement toward evil, if he lives by faith in God. In regard to religion, one illustration is sufficient, that of the unbridled tongue. That is the expression of an attitude of mind which is the opposite of love. When­ever the tongue is unbridled, untamed, unmanaged, there is evidence of lack of faith in God. The negative teaching concerning relative life is equally clear. Where there is no faith in God there is respect of persons. If we show a man into a back seat in the church because he wears shabby clothes, we are saying by that action that we have lost faith in God. We have no business to know whether he has on goodly apparel or not. It is quite as possible to have respect of persons in the opposite direction, as in the one which we most often con­demn. It is as possible to hold in contempt the man who is well dressed as to hold in contempt the man in rags. Faith in God does not see the incidentals. It is always conscious of the essentials. In speech, lack of faith means the tongue set on fire of hell. Is there a more startling and awful phrase than that in the whole of Scripture? A tongue set on fire of hell is the result of lack of faith in God. Where there is faith in God there is the silence of heavenly wisdom. Where it is lacking the tongue is set on fire of hell. It is almost impossible to read this word without feeling that James had in mind the symbol of the tongue of fire. Speech is always inspired hell or in heaven. It is always the expression of heavenly wisdom or an utter­ance inspired of hell. When the tongue is used to say things that are contrary to love and truth, it is because there is failure of faith in God. The master principle of true speech is that of faith in God. As to action; wars, strife, fighting, are all the outcome of fleshly lusts, all the result of the fact that the life is not governed by the principle of faith in God. The forces that overcome and spoil in­dividual life, and relative life, are all the result of the absence of the master principle of faith in God. The abiding appeal of this letter is first, prove your faith. "Count it all joy, my brethren, when ye fall into manifold temptations; knowing that the proof of your faith worketh patience. And let patience have its perfect work, that ye may be perfect and entire, lacking in nothing." In this connection, prove your faith, means venture on it, put it to the test. So to prove faith is to vindicate it. Vindicate your faith by venturing on it. When you venture on it, it immediately produces a definite result, and that result proves, or demonstrates, your faith. A man says, I have faith. Let him prove it. How shall he prove it? By argument? No, by venturing on it, by doing the things that are in harmony with faith in God. If a man says that he has faith, and does not venture on it, then no re­sults are produced. If he does not thus prove it, he cannot prove it at all. If he do not put this principle of faith into active proof, he cannot demonstrate the fact that he has faith; he rather demonstrates the fact that he lacks faith. As we pass through this letter and read the things that are de­nounced as evil things, and then look at our own lives, and find these things existing, we know that the measure in which these things are present is the measure of our lack of faith. On the other hand the measure, in which life perfectly harmonizing with the will of God is manifest in conduct, is the measure in which we are proving that we have faith. We prove the faith we have, and so we prove that we have faith. A man says, I have faith. I have no right to deny it; but I have the right to say; Prove your faith, put it to the test; live by faith homed in God, aiming at the perfection upon which the heart of God is set, and expect that by your faith in Him He will co-operate with you in that activity. He always does. In every victory won by faith there is the evidence of faith. The second note of the appeal is, Perfect your patience. Patience comes by proving faith; and patience issues in perfect life. "Let patience have its perfect work, that ye may be perfect and entire." Notice the. process. Faith is first. I believe the thing that God says. I will prove my faith by venturing on it, and doing the thing I could not do without it. In that deed I prove my faith to another man. In that victory won, patience fills my soul, I come to quietness and strength. When that patience, which is the outcome of faith, has completed its process, I shall be "perfect and entire, lacking in nothing." Thus it is clear that James was not arguing against faith; he was arguing for it. He revealed the fact that faith is the one and only principle that is equal to that perfection of life, upon which the heart of the Lord is set. The application of this letter to the individual is twofold. It teaches me first that the life of faith is a life of peril; and second, that the life of faith is a life of power. The life of faith is a life of peril. We cannot live the life of faith in God without being immediately in great peril. The life of faith challenges the spirit of the age. The spirit of the age is not in favor of faith; it never has been, it is not today. The spirit of the age is the spirit of life by sight, by wit, by wisdom, and by human cleverness. To live the life of faith is immediately to challenge the spirit of the age. The life of faith denies the call of the flesh. The moment we begin the life of faith in God, we begin where Christ said we must, "If any man would come after Me, let him deny himself." The life of faith provokes the enmity of the devil, because the life of faith is the only life that challenges the empire of sin. When a man begins to live by faith he inevitably therefore provokes the enmity of the devil. That is why the young Christian so often asks, how is it that since I gave myself to Christ I. have been tempted as I have never been tempted before? Immediately a man is regenerated he becomes the object of the attack of all spiritual antagonisms. The life of faith is not a soft, dilettante life in which we sing hymns all the time. It is a life of conflict, demanding heroism and courage and definiteness. It is a life of peril. "They climbed the steep ascent to heaven, Through peril, toil and pain," This truth is always true of the saints. But the life of faith is a life of power. If it challenges the spirit of the age, it is superior to the spirit of the age. If the life of faith denies the call of the flesh, it triumphs over the claim of the flesh. If the life of faith provokes the enmity of the devil, it causes the devil to flee. "Resist the devil, and he will flee from you." There is no other way in which you can compel him to flee. is experience. For that simple faith in God that obeys and ventures I am not an advocate merely. As a witness I declare that I have, and can, and do, overcome where else I were overcome. The life of faith is a life of peril; but it is also a life of power. The last word is an application of this teaching to the Church. In the assembly of the saints faith kills class distinctions. A community of men and women living by faith in God is at the end of the distinctions which are of the world, the flesh, and the devil. Let every church then test its faith not by recitation of its creed, but by that inner atmosphere of true communism and fellow­ship. The life of faith destroys all class distinctions. In the assembly of the saints faith makes strife impossible. In that aspect of the assembly which is local, or in that which is universal where there is strife there is lack of faith in God. In the assembly of the saints faith is the principle of communion. If we would correct the things of difference and hatred that are amongst us, we need to say to our Lord and Master what one said to Him of old, "Lord, I believe; help Thou mine unbelief." For inclusive value, suggestive teach­ing, beauty of statement, perfection of system, perhaps there is no writing of the New Testament more wonderful than this letter to the Hebrews. Its central teaching is threefold; first, the perfection of the revelation through the Son; second, the principle of life by faith; thirdly, the peril of death through apostasy. As to the first, the perfection of the revelation through the Son, there are three values of the revelation set forth; that it supersedes all others; that it meets all needs; and that it ensures all victories. This letter does not reveal Christ to us in His personal glory as some others do; but it does show that through the Son, God has given us His most perfect revelation of Himself. God is the first word of the letter; it is the theme of the letter. It is God revealed; God at work and God triumphing. As we take our way through this letter, we are following the pathway of God through human history to consummation. It begins where the first verse of Genesis begins; and before it closes, we find ourselves upon the mount, amid all the hosts of glory, as we find them in the Apocalypse. It teaches us first of all that the reve­lation through the Son supersedes all others; angelic, human, and ritualistic. It supersedes the angelic; for the Son is superior to angels. It supersedes the human, as represented by Moses and Joshua; for the Son is greater than the servants. It supersedes the ritualistic method, the method of the priest and the altar, the method of the temple and sacri­fice, and all the things through which God did by picture and symbol speak to men of Himself; because when the Son came, there was fulfillment of all of which these were but the shadows. When the Son came to speak from God, angels were no longer required, human teachers and inter­preters were set on one side, all ritualism was rendered unnecessary. The revelation through the Son was sufficient to meet all human need. The first need of man is a prophet who shall utter the word of God as the standard for his life. He needs also a priest, whose mediation shall reconcile him to God. He needs finally a king who shall govern according to the will of God. When the Son came He came as Pro­phet, Priest, and King, meeting all these needs; and this is clearly set forth in the argument of the writer. God speaks through the Son; and angels, and Moses, and Joshua are silent. So the prophetic need is met. Then He establishes a new covenant; and His priesthood is higher than that of Aaron, higher than the Levi­tical order, being of the order of Mel­chizedek. Thus the priestly need is met. Finally, He, as King, establishes the Kingdom of God in this world. So the kingly need is met. Once again, the revelation through the Son ensures all victories. The individual is perfected through the Son. The old economy with the law is abolished because it made nothing perfect. Social victory is realized through the Son; "Ye are come unto mount Zion, and unto the City of the living God, the heavenly Jerusalem." Finally, universal victory is made certain, for the ultimate glory is that triumph of God wherein He Who suffered shall find His perfect satisfaction. All that, so far as we are concerned, may be said to be objective. Faith is revealed as the principle by which these things become subjective, part of our own experience. If there is one book of the Bible which more carefully than any other defines faith, it is this letter. It contains one passage in which faith is defined in so many words, but that is not the only de­finition of faith which it affords. Faith, according to the whole teaching of the writer, is volitional surrender, and obedi­ence in spite of appearances. Faith is not merely intellectual conviction. Faith is the action of the will which follows intel­lectual conviction and harmonizes with in­tellectual conviction. That is the only faith that saves. Faith as a creed, appre­hended by the intellect, never saves. If we carefully follow the argument of the writer, when he is dealing with the subject of the people who could not enter in be­cause of unbelief, we discover that unbelief is described as disobedience. The men who triumphed by faith, were men who did things because they believed, when all appearances made it seem as though their doing was the doing of unutterable foolishness. Think of the unutterable madness of any man turning his back on Ur of the Chaldees and going, no one knew where not even himself, because he believed God, and looked for a city. That is faith; volitional surrender and obedience in spite of appear­ances. That is how the letter to the Hebrews in its wider teaching defines faith. Faith is not only defined, it is revealed at work. Faith is not merely a sentiment, an attitude of mind; it is energy that drives and accomplishes. These men did something. Faith also suffers, and the story of suffering is graphically told. And finally, faith waits, the most difficult thing that faith ever has to do; "These all died in faith, not having received the promises. . . . God having provided some better thing concerning us, that apart from us they should not be made perfect." And they are waiting still! The life of faith does not end when we die. The life of faith runs on into the paradise of God. There is no uncertainty in the waiting, no unhappiness, no misery; but they are waiting because the victory is not yet won, the work is not done, and God's King­dom has not yet come. For us the most heavenly activity, and the most difficult activity of faith, is to wait. So long as I can work, even though I may suffer, it is not so difficult; but when I can no longer work, or suffer, and simply have to wait, that is the most trying activity of faith. Finally, this letter gives us a picture of faith triumphant. It is triumphant in the deed. Go through the eleventh chapter again, and see how constantly those men did things, and how in the doing there was triumph. The things that they did are the things that have made the world what it is today, in so far as it harmonizes with the will of God. Faith suffers, but in the suffering it is trium­phant. It makes sorrow the occasion for song. Finally faith is triumphant in its waiting, for it is in itself the assurance of things hoped for, the certainty of the ultimate accomplishment of the will of God. The final note of the teaching of this letter reveals the peril of death through apostasy. Apostasy is defined here. It is the exact opposite of faith, and consists of disobedience because of appearances. Let the history interpret the teaching. The men of old said, The land is full of Anakim, and walled cities; these were appear­ances; because of them they disobeyed; that is apostasy; and so they failed to enter into rest. Therein is revealed the whole truth about apostasy. Men are not apostate because the doctrine they hold is wrong. They are apostate when they hold the true doctrine, and refuse to obey it. Disobedience is the unbelief that hardens the spirit, and ends in death. Apostasy is active also, it will do things. Apostasy will suffer; and will wait. Let no man imagine that by apostasy he will escape from effort, or suffering, or waiting. The strain of effort, the actuality of suffering, the tragedy of waiting all continue; but mark the difference. As faith is always triumphant in deed, and over suffering, and ultimately with God; apostasy is always hopeless in the deed, in the suffering, and ultimately without God. The end of apostasy is restlessness, just as surely as the end of faith is perfect rest. In the light of this central teaching, let us hear the abiding appeal of the letter. The first note of that appeal is one of warning, and the application is introduced in every case by the use of the word "Lest." There are two groups of such warnings. The first deals with perils threatening us in view of the finality of the speech of the Son; and the second with perils confronting us in view of the ultimate victory of God. The first group is found in the section of the letter specially dealing with the speech of the Son. God has spoken to us by the Son; we ought therefore to give most earnest heed to the things we have heard. "Lest haply there shall be in any of you an evil heart of unbelief, in falling away from the living God." "Lest any of you be hardened by the deceitfulness of sin." "Lest haply, a promise being left of entering into his rest, any one of you should seem to come short of it." That is a sequence. Lest we drift; that is the first thing; it is the picture of a vessel dragging its anchor and drifting. What next? "An evil heart of unbelief, in falling away from the living God." If I drift from the things the Son has said, I fall away from the living God Whom the Son reveals. With what result? I am "hardened by the deceitfulness of sin." With what issue? "A promise being left," I "come short of it." To avoid the first, is to be saved from all the rest. To fail in the first, is inevitably to pass through all the experience described in the rest. No storm is sweeping the sea; we are still close to the shore; but drifting just a little way. If by God's grace we recognize the drift, and hasten back, we shall not fall from the living God, we shall not become hardened, we shall not lose our rest. "Follow after peace with all men, and the sanctification without which no man shall see the Lord : looking carefully lest there be any man that falleth short of the grace of God; lest any root of bitterness springing up trouble you, and thereby the many be defiled; lest there be any forni­cator, or profane person, as Esau, who for one mess of meat sold his own birthright." These three warnings occur in that part of the letter which has to do peculiarly with the ultimate victory of God. In the eleventh chapter we pass through the hall of the heroes and heroines of faith in the past; the last note is that which declares that the whole of them are not yet made perfect. Then in chapter twelve, we are brought face to face with our own ex­perience in its relation to the ultimate victory of God. The first warnings had to do with the revelation of the Father through the Son, and the notes were those of personal rela­tionship; Lest we drift, Lest we fall away from the living God, Lest we become hardened, Lest we lose our rest. But now there is something more important than our rest, our heaven. It is God's glory which is in view, the joy that was set before the Christ. We are responsible about that. "Lest there be any man that falleth short of the grace of God." Falling short of the grace of God means being unable to run the race or to co-operate with God in the work that makes His Kingdom come. "Lest any root of bitterness, springing up . . . the many be defiled" and there­fore cannot run the race. Lest there be a profane person who will turn his back upon the high, supernal glory of God for some mess of earthly pottage, and so fail to co-operate toward the consummation. These warnings do touch personal salva­tion, but that is not the ultimate meaning of them. If we fail, we fail to co-operate with God for the bringing in of His Kingdom and His glory. Falling short of grace is falling short of life; the root of bitterness is falling short of love; the profane person is falling short of light. If we fall short of life, of love, and of light, we cannot run this race and be fellow-workers with God. These three warnings then have ultimately to do, not with the matter of personal salvation, but with the matter of our fitness for co-operation with God in order to the winning of His victory in the world. Thus, warnings greet us at the beginning of the letter, and confront us at its close. The appeal of this letter is also one full of encouragement, and the notes are intro­duced by the words: "Let us." They fall into three groups; words intended to encourage us in our relation to the Son through Whom the final speech has been uttered; words to encourage us as to our own saint ship; and words to encourage us in our service. Those referring to the Son touch upon His threefold work as Prophet, Priest, and King. "Let us therefore give diligence." We are to fear lest the promise being made we do not enter in. We are to be diligent "that no man fall after the same example of disobedience." Both these words of encouragement have to do with the prophetic work of Christ, the teaching of Christ. "The word of God is living, and active, and sharper than any two-edged sword, and piercing even to the dividing of soul and spirit." Let us fear lest we fail of the promise made in the Word, and let us be diligent in order that there be no disobedience to the Word. "Having then a great high Priest, Who bath passed through the heavens, Jesus the Son of God, let us hold fast our confession." "Let us therefore draw near with bold­ness unto the throne of grace, that we may receive mercy, and may find grace to help us in time of need." These words have to do with the priestly work of the Son, and need no exposition. "Wherefore let us cease to speak of the first principles of Christ, and press on unto perfection." That is a picture of the ultimate victory of the King, Who will build the city, and establish the Kingdom; and towards that victory we are to press on. "Let us consider one another to provoke unto love and good works." As in the first group of five words we have encouragement as to the Son as Prophet, Priest, and King; here we have words of encouragement as to the experience of saint ship in the present life, and they again need no exposition. “Let us run with patience the race that is set before us." In order to co-operate in the work which will eventuate in the victory we are to lay aside all that hinders, run with patience, and have grace. "Let us therefore go forth unto Him without the camp, bearing His reproach. . . . Let us offer up a sacrifice of praise to God continually." In such service we are to have fellowship with Him in suffering; and fellowship in praise. The teaching of this letter assumes the Biblical conception of God. Its first note is that of His universal sovereignty. The God of the Bible is not a Being within the universe, enslaved by it. He is Sovereign. The God of the Bible moreover is knowable and revealing. He spoke in times past; He has spoken in His Son. If we deny these things we shall of course find no teaching in the letter to the Hebrews. There can be no meaning in it, apart from these fundamental conceptions of God. Again, the teaching depends upon the Christology of the writer. We have it set before us in the early part of the letter. There is a sevenfold description of Christ, leaving no question as to the position He occupied in the mind of the writer. To deny the Christology of the writer is to deny his appeals. If our Christ is not the Christ of this writer; He is not superior to angels, to Moses, to Joshua, to Aaron, to all that magni­ficent ritualism which the writer knew so well. If this letter is to be of any value to us in the Christian Church, we must be true to its conceptions of God and its presenta­tion of Christ. To the individual, the word of application is that of its teaching as to the power of faith, and the peril of apostasy. In this letter as in the second and third letters of John, we have pictures and portraits which serve as illustrations. The letters of the first imprisonment of Paul, in the order of their placing in our Bible, were those to the Ephesians, the Philippians, the Colossians, and Philemon. The value of the last consists in the fact that it is an illustration of the outworking into everyday life of the great doctrines dealt with in the other three. It is a page of pictures of Christianity in its outworking. They are all boldly drawn, in bare outline, yet full of beauty. We have first, pictures of individuals; Paul, Philemon, Onesimus. Second, pictures of social relationships; Paul and Philemon; Paul and Onesimus; Paul, Philemon, and Onesimus; and finally we have a picture of the Church. Thus in this one page of the New Testament we have at least seven pictures presented to the mind. Let us first look at these pictures in bare outline. The first is that of Paul. Of course we have no biography, no autobiography; no detail about those minor matters of human life which we so perpetually emphasize when we tell the account of the lives of men; but the essential facts of his character are revealed in this letter all unconsciously by the writer. First this letter reveals Paul as a man of triumph over circumstances in fellowship with Christ. He is seen second as a man triumphing over the right to exercise per­sonal authority in the power of his love. He is also seen as a man triumphing over personal inclination in a great passion for righteousness. If there were no other revelation of Paul in the whole of the New Testament, this in itself reveals the trans­formation wrought in him, and manifested through him, as the result of his life in Christ, and consequent fellowship with Christ. Paul was a prisoner in Rome, and by his imprisonment all his missionary journeys were at an end; the burning passion of his heart to be out upon the highway of mis­sionary endeavor, pressing forever on to the regions beyond, might have been quenched as he found himself held by the irksome chain of his imprisonment. That however, is not the way in which Paul refers to his imprisonment. He describes himself as "Paul a prisoner of Christ Jesus." That is perfect triumph over circumstances in the power of fellowship with Christ. That is the first fact of the outworking of Christianity in individual experience. Fel­lowship with Christ gives the individual perfect triumph over circumstances. Paul was a prisoner not of Rome, not of the Roman emperor, but of Jesus Christ, He saw through all the secondary, incidental things, to the primary and fundamental fact, that, to the man abandoned to the will of his Lord, nothing can happen out­side the good and perfect and acceptable will of God. How many of us really know what it is, in circumstances of limitation, when all our highest aspirations seem checked and thwarted, when our passion to work for God is not allowed to find vent and exercise, to sit down and write of ourselves as the prisoners of Christ Jesus? That is the privilege of all the saints, but it is only possible to those who are living in true fellowship with Jesus Christ. The next note is that of triumph in the power of love over the right to exercise authority. Not that the authority of Paul was lessened; not that his appeal would fail to produce the effect he desired; but here was a man who had the right to command that which was befitting, but who said, I will not charge, command thee; I prefer to beseech thee for love's sake. That is the perfect victory of love in the life of a man; when he is able not to command, though his authority for so doing may be vested in Christ, but chooses rather to deal with others as God does, by beseeching in love. That is the Divine method; "As though God were entreating by us; we beseech you on behalf of Christ, be ye reconciled to God." Then finally there was triumph over personal inclination in a passion for right­eousness. Notice the two I would’s of Paul in verses thirteen and fourteen. "Whom I would fain have kept with me" is the "I would" of personal inclination. Onesimus was the child of his bonds, he would have ministered to him and made things easier for him, so that the apostle said, I would like to keep him with me. But the second "I would" is the revelation of his sacrifice of personal inclination, because he knew the other course to be right. It was a triumph over inclination in the passion for the right. When I think of Paul I am usually im­pressed by the magnificence of his intellect sanctified by the indwelling Spirit; and by his tremendous devotion to his Lord; but here I see the profoundest things of his character. Christianity outworking through his experience was manifested as triumphing over circumstances in the fellowship of Christ, so that he could say I am the prisoner of Christ, while to all human seeming he was the prisoner of Rome; triumphing over the right to exercise personal authority on highest levels, in the power of love, so that rather than charge, he besought; triumphing over inclination to keep Onesimus to be useful to himself, in the passion which was in his heart for the doing of the right thing in all circumstances. The next picture is more briefly drawn. It is of "Onesimus, who was aforetime unprofitable to thee, but now is profitable to thee and to me." There was a sanctified humor in Paul's play upon words here. It was Martin Luther who said, "We are all the Lord's Onesimi, we are all the Lord's profitable servants. How have we been made profitable to the Lord? We were unprofitable." This man, said Paul in effect, when he was with you, Philemon, bore a name to which he was not true; he is now Onesimus in reality, profitable to thee and to me. The picture of Onesimus is that of the radical change which Christ works in the life of any man of whom He gains pos­session; the unprofitable becomes profitable. It is a perpetual picture of what Christ does with men. The waste, unprofitable material He makes valuable, profitable. The last of these single pictures is that of Philemon; "Hearing of thy love, and of the faith which thou hast toward the Lord Jesus, and toward all the saints . . . for I had much joy and comfort in thy love, because the hearts of the saints have been refreshed through thee, brother." Philemon was a man governed by two principles, faith and love. These were associated in his practical life. As to faith Paul said, "The faith which thou hast toward the Lord Jesus, and toward all the saints." Faith toward the Lord Jesus and faith toward the saints. The preposition employed in each case is the same; and what is meant in one case is meant in the other. The fundamental principle in the life of the Christian man is faith toward the Lord Jesus, and toward the saints; and that faith toward the Lord Jesus and toward the saints is expressed in love; love works through faith. The experimental order is revealed if we take the portraits in the other order. Beginning with that of Philemon, we see the principles of faith and love; glancing next at Onesimus, we see a man changed from unprofitable to profitable; finally, looking at Paul, we see the triumph of Christianity in its outworking in a threefold application. Turning to the picture of social relation­ship we come first to that of Paul and Philemon. I should be inclined to write underneath the picture of these two men as I see them here, "Love seeks not its own." The apostle wrote to his friend, "Without thy mind I would do nothing; that thy goodness should not be as of necessity, but of free will." That is very simple and very human; yet the very simplicity and humanness of it constitute its inspiration and beauty. In effect Paul said; I should like to have kept Onesimus, but I would not without thy mind. If I had kept Onesimus you would not have complained; but you would have been helpless, and your goodness would have been of necessity. I want your goodness to be manifested towards this man, of your own free will. I am seeking the develop­ment of your Christian character at its highest, noblest, and best. I would have kept him; but I am seeking not only his blessing, and his restoration to favor; but your blessing, and the development of all that is highest and best in you. If you did a good thing of necessity, it would not be on the highest level; but if a good thing be done of your own free will, it is on the highest level. Thus in this beautiful, tender, gracious regard of Paul for Philemon, is revealed the love which seeks not its own. The next picture is that of Paul and Onesimus. Beneath that I would write the words "Love beareth all things." The Greek word translated beareth suggests a roof upon which the rain falling, the person standing underneath is protected. Love is a covering roof; sheltering the friend beneath. "If he hath wronged thee at all, or oweth thee aught, put that to mine account," wrote Paul. Onesimus the unprofitable runaway slave was the child of Paul's very heart, the child of his bonds; and Paul's love was the roof over Onesimus which protected him. Love beareth all things. That is the relationship which Christ creates between men. The third picture of relationship is of that between Onesimus and Philemon. Here let us write the words "Love suffers long, and is kind." What will Christianity do in this case? Onesimus was the runaway slave of Philemon. What will Christianity do with him? Send him back. The slave must return. What will Christianity do in the case of Philemon? It will prepare him to receive him as a brother; "No longer as a servant, but more than a servant, a brother beloved"; and as a partner, "if then thou countest me a partner, receive him as myself." Then followed that touch, which did not say the last thing, but pointed the way to it as the apostle wrote, "Having confidence in thine obedience I write unto thee, knowing that thou wilt do even beyond what I say." That something beyond was almost certainly the giving of his freedom to the slave. Christianity sent Onesimus back to fulfill the obligations of the law. Christianity taught Philemon to receive the slave kindly, and cancel the obligations of the law in the power of indwelling love. Finally we have a picture of the church in the house of Philemon. Its title may fittingly be "Love never faileth." Paul wrote to the church, because in the highest ideal of Christianity, you cannot write to the individual without the church being interested and being brought into co-opera­tion. The true fellowship in Christ Jesus is such that if one member suffers all suffer, and if one member rejoices all rejoice; when one member fulfills obligation and goes back to duty, all the members co-operate with him in his return; if one member fulfills the law of love and receives the runaway, all the members enter into the joy of heart that comes to the one. We have here then a picture of an ideal church in which the runaway slave is to be received on his return as a brother and a partner by all who share the common life, and walk in the common light, in the power of the common love. If this be the central teaching of these pictures of Christianity in the outworking, what is their abiding appeal? I am con­strained to say that it is not to be found stated in words in the epistle. The pictures themselves create the appeal. They appeal to all who look upon them and who share the life which produces these results, to yield themselves to that life entirely, absolutely. In order to find the appeal of this letter stated in actual words I go back to the other epistles written in imprisonment. It has often been pointed out that some of the greatest things we have ever had for our spiritual instruction were written in prison. Paul never rendered greater service to the Church of God, than in those days when he was shut up in prison. No others are more wonderful, fuller of light and glory, more evidently the revelation of the Spirit of God to His servant, than the letters of the imprisonment. The apostle was thinking the Ephesian, Colossian, and Philippian letters, and while such thoughts filled his mind he wrote this letter to Philemon about a runaway slave. There was a time when some thought that this page should be left out of the New Testa­ment because the subject was not worthy the dignity of an apostle; but thank God that in His overruling in the arrangement and selection and preservation of the writings which are essentially of the Spirit, Philemon is not left out. In this epistle we see the commonplaces of everyday life set in the atmosphere and power of the most awe-inspiring things of the eternities. 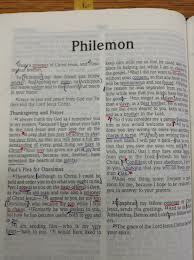 Philemon is but a page of pictures resulting from Ephesians, Philippians, and Colossians. 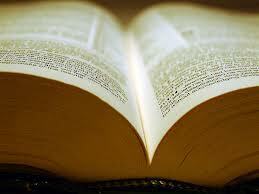 I go then to these great epistles and take from them the central words of each in order to find the words of appeal. In Ephesians, that great unveiling of the glorious Church, "Be filled with the Spirit." In Philippians, that great unveil­ing of Christian character, "Have this mind in you, which was also in Christ Jesus." In Colossians, that great unveiling of the glory of Christ as at the disposal of the Church, "Let the word of Christ dwell in you richly." That is the threefold abiding appeal of the letter to Philemon. How is it possible for me to live the life of faith and love? How is it possible for me, who have been most unprofitable, to be indeed a man profitable? How is it possible for me ever to know such triumph over circumstances as Paul manifested; such triumph over personal authority in the power of love; such triumph over personal inclination in the passion for righteousness?—How can I fulfill this life? All the necessary resources are in Christ. Then the power of Christ must have full sway, and right of way in and through me; and my responsibilities are stated in the words of these great epistles, "Be filled with the Spirit," "Have this mind in you, which was also in Christ Jesus," "Let the word of Christ dwell in you richly." What then are the applications of this brief letter? First as to the individual. This letter teaches me that life in Christ changes every relationship. All the rela­tionships that might be suggested do not appear upon this page; but those which do appear have a bearing on all the rest. My son, my daughter, my father, my husband, my wife, my neighbor; all bear new relationship to me the moment I am a man in Christ. I bear a new relationship to them, and consequently they bear a new relationship to me. I have a new relationship to my servant if I am a man in Christ. I have a new relationship to my boss if I am a man in Christ. I learn also that our relationships to others test our relationship to Christ. Not by what I sing about my Lord, not by what I affirm of relationship to Christ, but by my relationship to other men, is my relationship to my Lord made manifest. Philemon angrily refusing to receive One­simus would have contradicted all the profession he made of love for Jesus Christ. Onesimus refusing to return to Philemon would have rendered null and void all his profession of faith in Jesus Christ. Had Paul yielded to personal inclination he would by that act have proved a measure of disloyalty to Christ. It is the relation­ships I bear to other men which constitute the real test of my relationship to Christ. If I am living in true fellowship with Him, letting His mind be in me by being filled with His Spirit, and having His word richly dwelling in me, my relation­ship to others will be changed; and my relationship to Christ will be revealed. There is one word of application to the Church at large. From this letter one of the profoundest matters is learned; that social evils are to be ended by the trans­formation of men, and in no other way. There is no protest here against slavery. There was a day when Christian teachers used this very letter in defense of slavery. We know full well that any such use was absolutely unwarranted. Onesimus was sent back to Philemon, but Philemon was charged to receive him in a new way. The highest work of Christianity is to transform men, so that out of their transformed lives shall come the transformation of all social conditions, and the victories of righteousness and of love.